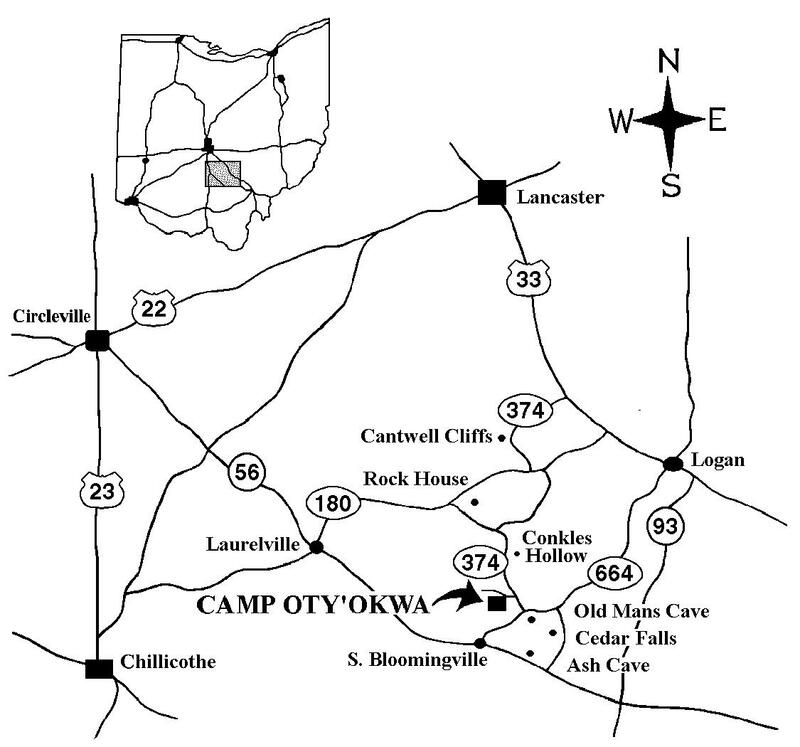 Camp Oty’Okwa is in the heart of the Hocking Hills, in southeastern Ohio. We are located approximately 1.5 hours from Columbus, Ohio. We are 2 miles from Old Man’s Cave (Hocking Hills State Park) and 1 mile from Conkle’s Hollow (Nature Preserve). 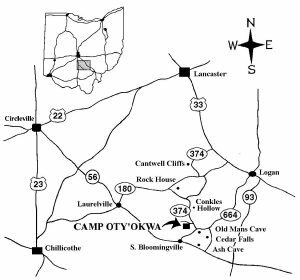 We strongly urge you NOT to follow the directions given on internet map systems such as “MapQuest” or most GPS directions based on the Camp Oty’Okwa mailing address. These maps often misdirect guests onto one lane gravel roads with poor or no signage for adequate guidance. Please call 740-385-5279 if you have any questions or need additional information on directions. Option 1: Take I-70 east to St. Rt. 33 South. Proceed to Logan and get off at St. Rt. 664 (the first Logan exit) then turn right (south). Take St. Rt. 664 past Old Man’s Cave and Grandma Faye’s (approximately 12 miles). Turn right (north) onto St. Rt. 374 and then veer left onto Purcell Rd. (100 yards). St. Rt. 374 and Purcell Rd. is a “Y” intersection. Option 2: Take I-270 south to St. Rt. 23 to Circleville. At Circleville, take the St. Rt. 56 / 22 exit ramp and turn left (east). Follow St. Rt. 56 through Laurelville to S. Bloomingville. At the three way intersection, go straight ahead which becomes St. Rt. 664. Continue on to the top of the hill where you will turn left (north) onto St. Rt. 374 and then veer left onto Purcell Rd. (100 yards). St. Rt. 374 and Purcell Rd. is a “Y” intersection. From Dayton, take St. Rt. 35 east to Washington Courthouse. Take St. Rt. 22 east to Circleville where it merges with St. Rt. 56. continue east on St. Rt. 56 through Laurelville to S. Bloomingville. At the three way intersection, go straight ahead which becomes St. Rt. 664. Continue on to the top of the hill where you will turn left (north) onto St. Rt. 374 and then veer left onto Purcell Rd. (100 yards). St. Rt. 374 and Purcell Rd. is a “Y” intersection. From Cincinnati, take I-71 north to St. Rt. 35 and then east to Washington Courthouse. Take St. Rt. 22 east to Circleville where it merges with St. Rt. 56. Continue east on St. Rt. 56 through Laurelville to S. Bloomingville. At the three way intersection, go straight ahead which becomes St. Rt. 664. Continue on to the top of the hill where you will turn left (north) onto St. Rt. 374 and then veer left onto Purcell Rd. (100 yards). St. Rt. 374 and Purcell Rd. is a “Y” intersection. South: Take St. Rt. 23 north to St. Rt. 180 east. At Laurelville, turn right onto St. Rt. 56 and go to S. Bloomingville. At the three way intersection, go straight ahead which becomes St. Rt. 664. Continue on to the top of the hill where you will turn left (north) onto St. Rt. 374 and then veer left onto Purcell Rd. (100 yards). St. Rt. 374 and Purcell Rd. is a “Y” intersection. Southeast: Take St. Rt. 33 north from Athens through Nelsonville to the Logan area. Exit at St. Rt. 664 (Old Man’s Cave and Hocking Hills State Park) and turn left. Take St. Rt. 664 past Old Man’s Cave an Grandma Faye’s (approximately 12 miles). Turn right (north) onto St. Rt. 374 and then veer left onto Purcell Rd. (100 yards). St. Rt. 374 and Purcell Rd. is a “Y” intersection. Take I-70 west to St. Rt. 37 and turn left (south) about 15 miles to Lancaster. At the third traffic light in Lancaster, turn right onto Fair Ave. Again, go to the third traffic light and turn left (south) onto Memorial Dr., also known as St. Rt. 33. Proceed to Logan and get off at St. Rt. 664 (the first Logan exit) and turn right (south). Take St. Rt. 664 past Old Man’s Cave (approximately 12 miles) and Grandma Faye’s. Turn right (north) onto St. Rt. 374 and then veer left onto Purcell Rd. (100 yards). St. Rt. 374 and Purcell Rd. is a “Y” intersection. From All Directions, Please Note: Purcell Rd. and the entrance to Camp Oty’Okwa are only 100 yards to the left once you have turned onto St. Rt. 374. If you proceed down the hill, you have gone too far and missed the entrance. • Coultrap Lodge is the second drive on the left. • Cardinal Lodge is the first building on the right. • The Main Campus area is the third drive on the left between the pool and the Rahal Activity Center (the large barn with green roof).